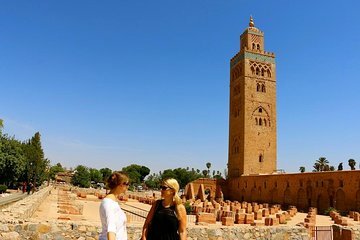 Discover Marrakech with a private guide on a full-day, private tour from Agadir that explores the culture and history of a fascinating Imperial City. You’ll travel to Marrakech in the comfort of a private vehicle, then join a local guide for a walking tour of the medina and Jemaa el-Fnaa, a bustling square that’s a UNESCO World Heritage Site. Spend the afternoon in an idyllic garden in the heart of the city, where artist-designed garden paths wind through gorgeous plants and architecture, returning to Agadir in time for a late dinner.